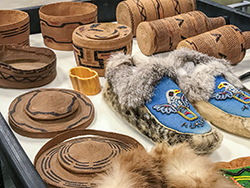 A Washington family has donated an exquisite collection of Northwest Coast objects to Sealaska Heritage Institute (SHI) so that it may be studied by artists and scholars. Donors Stephanie Cady, Patricia Maxwell and Michelle Campbell, originally from Hoonah, made the donation last week in memory of their brother, Hugh Dean Daniels III, who recently passed away. SHI President Rosita Worl said she was grateful to the family for giving the objects to SHI and for taking such good care of the collection, which includes finely-woven spruce-root basketry and several exceptional mountain goat horn spoons. Both art practices have been classified as endangered arts, Worl said. She also stressed the importance of having the collection at SHI, where artists will be able to study the objects. “SHI also is exploring how we can transmit virtual 3-D images to villages to study the masterpieces,” Worl said. The collection includes four spruce-root baskets; three bottles with spruce-root weaving wraps; seven spoons, including five horn spoons; two pairs of beaded moccasins; one model canoe; and one bone piece that was possibly used to hold a napkin. The objects were collected by Patricia Kane Daniels, the late mother of Cady, Maxwell and Campbell, when the family lived in Juneau in the mid 1900s. The pieces were donated in honor of the Hugh Dean Daniels III Trust. Sealaska Heritage has witnessed a growing trend of donors returning pieces, including sacred objects, to the tribes, Worl said. “We are receiving these collections from donors who realize that Sealaska Heritage has climate-controlled facilities that meet museum standards and the expertise to care for these collections. 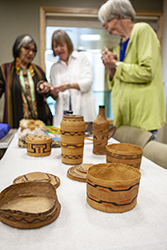 Donors also feel good about returning objects to their original home where they are so meaningful to Native people and can teach us more about how to perpetuate these ancient art practices,” she said. SHI also is working with federal lawmakers to create a tax credit for people who return sacred pieces to tribes.